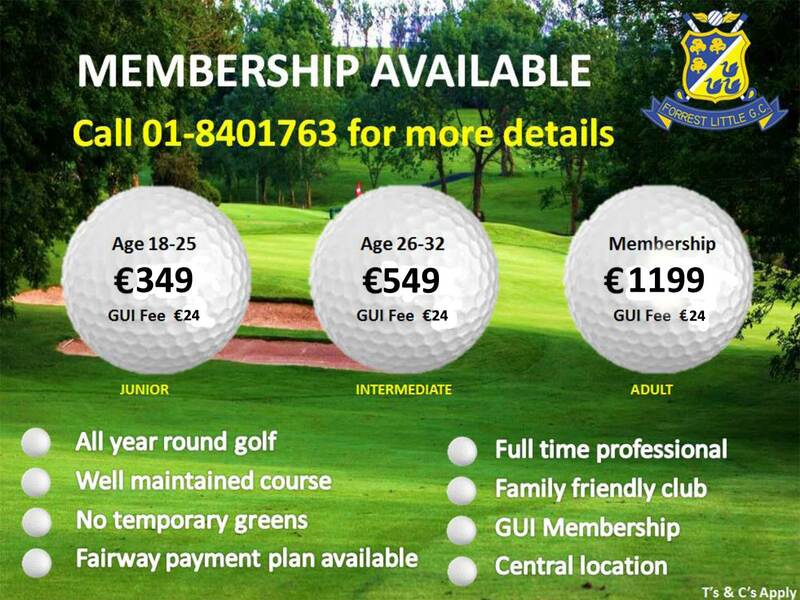 Join on one of our membership options below and enjoy the added benefit of 5 Day Membership at Corrstown Golf Club free of charge. Forrest Little provides a great golf experience and team golf opportunities across all handicap ranges. We are presently recruiting new members across all categories, Men and Ladies Full, 5 Day, Juniors, Juvenile boys and girls and Cadets. For a limited period only, Forrest Little has ‘NO ENTRANCE FEE’ for new members. Call us now +353 (0)1 840 1763 for an opportunity to join this ‘hidden gem’ and experience great golf in a friendly welcoming atmosphere. Forrest Little has a range of membership categories to cater for young, new and experienced golfers. All prices are per annum and include subscriptions, levies and insurance. (includes €200 payment to loyalty card). Forrest Little welcomes young golfers of all abilities and has reduced fees in all categories. Cadet 7-10 years on 1st May. €60, 2 cadets in one family €100, 3 cadets in one family €150. Playing confined to Ist May -30th September each year. Juvenile Grade 1 aged between 11 – 15 years on 31st December €125 with all year round playing facility. Juvenile Grade 2 aged between 15 -18 years on 31st December €188 with all year round playing facility. Our family friendly ethos is at the heart of Forrest Little and that is demonstrated in our fee structure for families (Father, Mother, Spouse/Partner) who pay two Full Membership subscriptions can avail of 75% discount for their qualified children in the categories of Cadet, Juvenile, Junior or Intermediate. * Terms and conditions apply to these membership categories. For those who don’t want to play golf but want to enjoy the other benefits of being a member of Forrest Little and avail our our club house facilities. Annual fee is €250 which includes €200 Loyalty card – bar/restaurant credit.